We’d love your help. Let us know what’s wrong with this preview of Her Forever Man by Leanne Banks. Her Forever Man by Leanne Banks released on Dec 24, 1999 is available now for purchase. 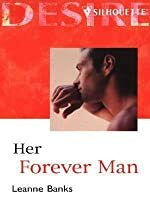 To ask other readers questions about Her Forever Man, please sign up. Felicity was a silent partner in Brock's ranch, so when her attorney's suggested she use some time to think about what she wanted to do with her money and her life, she decided to go stay at the ranch. Brock disliked her on sight, while the other males including his brother were drooling over her. Felicity liked Brock, she just wish he liked her. She knew Brock was sexually attracted to her, so why couldn't he want all of her? As the time went on Felicity and Brock's children grew attached to each Felicity was a silent partner in Brock's ranch, so when her attorney's suggested she use some time to think about what she wanted to do with her money and her life, she decided to go stay at the ranch. As the time went on Felicity and Brock's children grew attached to each other and Felicity wanted to stay at the ranch but Brock didn't want her to, so he sent her packing back to New York. Brock's kids begged to have her back so finally Brock's brother, Tyler called Felicity and told her to come back to the ranch and not give up on Brock's love. Felicity came back to the ranch and fought for Brock and this time she wasn't letting him get away. However Brock believed in the Logan Curse, that a Logan's bride will always leave. Over time once again Felicity proved she loved him and would stay. Leanne is known for telling a story with strong emotion, characters with whom everyone can relate, a kick of hot sensua Leanne Banks was born on 14 May 1959 in Roanoke, Virginia, USA. She holds a Bachelors degree in Psychology, which she claims she can only use on fictional characters. When her first book was published in 1991, she used the money from her advance to take her family to Disney World.